The name Sunit comes from the Sanskrit Word Suniti. This means a person with Good Policies and Intentions. Dr. Gupta is a synonym for a modern sadhu, swami, guru, pundit, scholar, jyotishi, palmist, messenger, helper, healer, devotee, yogi, tantrik, singer, actor, counselor, life coach, reiki grand master, Ashihara karate chairman, intuitive, spiritualist, Business Consultant/Trainer with U.S. Goverment's SBDC and what not? Sunit is a well known name throughout the World for his accurate predictions and through his philanthropic endeavours. Specifically his predictions for Bill Clinton and George Bush becoming the President was flawless. and has been featured Worldwide in newspapers , television and radio all over the world including C.N.N., Doordarshan, Voice of America. He also has his own T.V. and radio programs 'Psychics: Myth or Fact', 'Spiritual Dimension of Life' , 'L.A. Masala' since more than last two decades. 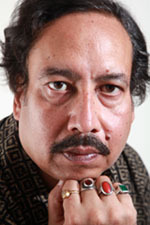 For years he was also a columnist for L.A.India (Now India Journal) , Indian News Express and Crescent News Express.